Note: To update any of these details, please email Curtis at cullerich@ucanr.edu. 4-H members may present at a Presentation Day to receive feedback and an award. Each county organizes a County 4-H Presentation Day. 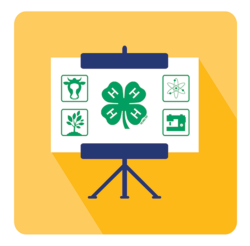 If you receive a Gold award at the county level, you are encouraged to present in an Area 4-H Presentation Day. You may present at ANY Area 4-H Presentation Day (not just the one organized for your Area). You can also present at multiple Area 4-H Presentation Days if you would like to try to improve your score or get more practice. If you receive a Gold award at any Area Presentation Day, you may present at the State 4-H Presentation Day. Primary members (ages 5-8) are encouraged to participate in Area Presentation Day as well, but can only receive participation seals and cannot be evaluated according to the Presentation Manual. The 4-H Presentation Manual - Revised October 2016 is the standard guide for all 4-H presentations. The included evaluation forms must be used at all 4-H Presentation Days. The Area Presentation Days are coordinated by the California 4-H Management Board. This map shows all Area Presentation Day events. Time: Event starts at 8:30 am See the full schedule and more details.